Saturday 18th - Oh Boy! This is the seventh show of 13 recorded for export to the United States. 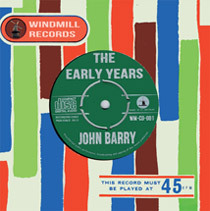 It is now thought that this original telerecording, once catalogued with ABC at Teddington, Middlesex until 1968, may be in the private hands of someone in the United Kingdom. Also some of the 13 copies sent to America are known to exist and in the possession of a private collector in Arizona or New Mexico. Lonnie Donegan makes his second and final appearance in the series. He had previously appeared on show No.20 on 24th January 1959. The American vocal group The Inkspots make their only appearance. Jack Good’s attempts to secure big US names for “Oh Boy” begins to pay dividends. Renee Martz, an American teenage preacher, makes the first of two appearances in the series. He later appeared on the 23rd May edition. Jack Good secures appearances for Cliff Richard and the Drifters for 3 dates in May: 2nd, 23rd and the final show on the 30th. Their appearances on “Oh Boy!" were increasingly sporadic in 1959 while they performed a heavy schedule of provincial theatre dates around the country. The group did not appear in the series for the entire months of February and April. Jack wanted them for the final shows in May to ensure the series went out with a bang!